2015 Vintage Described by some as an ideal year…others have highlighted the July drought and then rain at harvest time. However, the drought was relieved by rain in August and the pre harvest weather was perfect, and although some rain later, it hardly penetrated to the roots. We can report that the fruit quality was superb all over Bordeaux, and 2015 is indeed a very good year and certainly the best since the wonderful 2009 & 2010 vintages. The wines have delicious ripe fruit flavours and their fine tannic structure promises a great future. For full information on the MMD UK en primeur exclusivities, please click on the link below. Château de Pez, west of the commune of Saint-Estèphe, rivals Calon Ségur as the most ancient of all the Bordeaux vineyards. Champagne Louis Roederer purchased the estate in June 1995 and immediately set about improving the vineyards and cellars. The estate has 39 hectares under vine, planted with Cabernet Sauvignon, Merlot, Cabernet Franc and Petit Verdot. The vineyard dominates a high plateau with well-exposed slopes. At the summit there is a deep layer of Günzian gravel overlying the clay and limestone bedrock of Saint-Estèphe. Here, the Cabernet Sauvignon thrives on the free draining soils whilst Merlot dominates on the lower slopes with heavier clay soils. The plantings contain many old vines, averaging 30 years of age. Blended in December from the various parcels of wine and then stored in barrels (40% new wood, 40% in one year old and 20% in two year old casks) and racked every three months, it is worth noting the wine undergoes absolutely no filtration. The wines of Château de Pez have an attractive tannic structure worthy of further ageing. They are sometimes referred to as the ‘Pomerols’ of Saint-Estèphe, in part due to the smooth roundness brought to the wine by the Merlot vines grown on the exceptional soils. They tend to be dark in colour and have great length, body and distinction and are best appreciated after 5+ years. 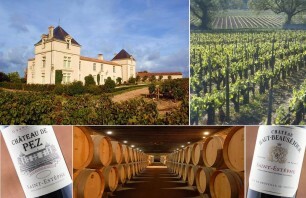 In 1992, Champagne Louis Roederer discovered two properties in the heart of the Saint-Estèphe region – Château Picard and Château Beauséjour – both of which received Cru Bourgeois status in 1932. Together, the pair formed an estate of nearly 31 hectares, including 27 hectares of vineyards. The most promising slopes of the new estate now called Château Haut-Beauséjour, covered about 20 hectares. A quality charter for Château Haut-Beauséjour was drawn up, covering vine size, de-budding, green harvesting, a return to manual harvesting and double grape selection firstly in the vineyards and then again at the sorting table at the Château. In 1993, the cellars and cuverie were entirely renovated and the Château was kitted out with top-of-the-range equipment. Château Haut-Beauséjour is made from a selection of grapes from their finest slopes in Saint-Estèphe combined with an expertise that brings the balance and distinction of fine Médoc wines. Château Haut-Beauséjour drinks well when young but has a capacity for ageing for several years.